Rellenong Manok is another Filipino party dish, always present on the tables come family-and-friends-festivity time. 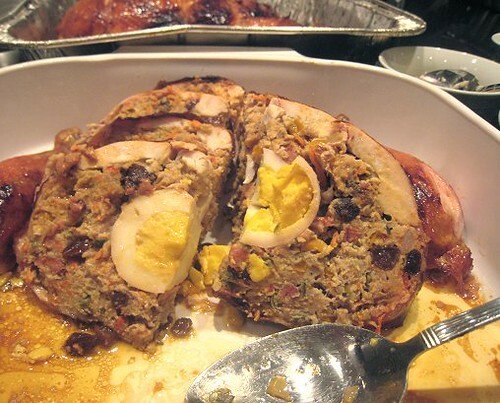 Anything that is "relleno"-ed is stuffed, so this is a deboned whole chicken stuffed with a sweet and savory pork filling. It's been quite some time since I've had Rellenong Manok, so when my father's birthday rolled along, just one week after we did major cooking for our New Year's Eve Spanish menu, I suggested that we serve Rellenong Manok as one of our party dishes. Of course, I gave this suggestion with the implication that I will not be the one cooking this dish, but rather, TS. 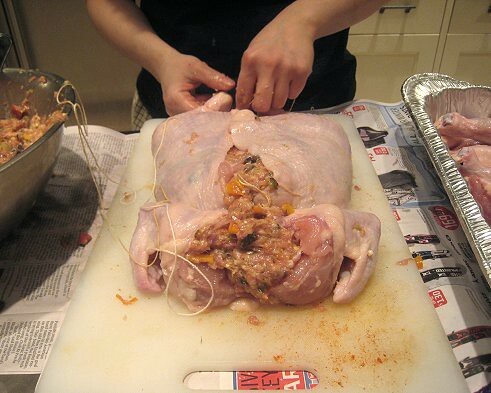 It is "understood" that I do not have the manual dexterity nor the patience to go through the whole process of deboning the chicken and stuffing them into chicken-verisimilitude back together again. 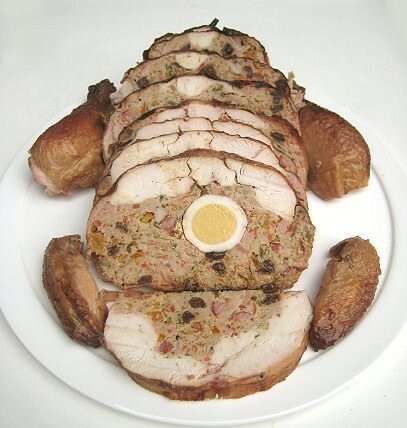 The stuffing is simply an embutido! That's a mixture of ground pork, sweet pickle relish, chopped ham, grated cheese, green & red bell peppers, grated carrots, chopped onions, minced garlic, raisins, Worcestershire sauce, salt and black pepper. Of course, one mustn't forget the Vienna sausages (you read right!) and hard-boiled eggs. 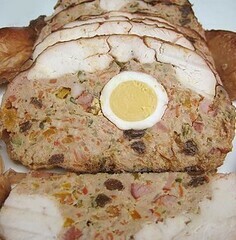 For details, go to our Embutido (Philippine Pork Roll) post. Let's not dilly-dally. Let's get right to it. 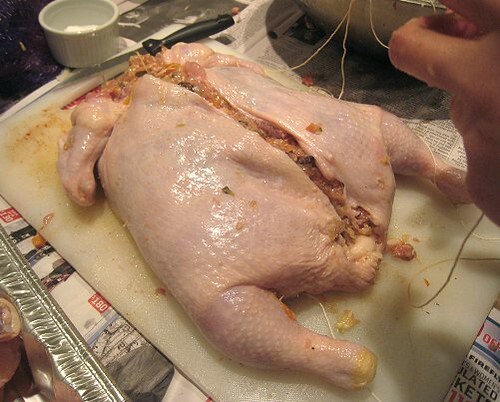 Unfortunately, we don't have step-by-step photos of how to debone a whole chicken. What I found useful is a tutorial JS found for me online. I simply stopped at step 6, keeping the legs and wings intact. 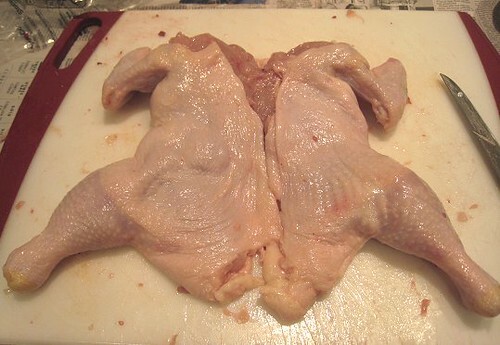 Otherwise, the chicken would look weird being wingless and legless, like Boxing Helena. I left the breast meat intact. 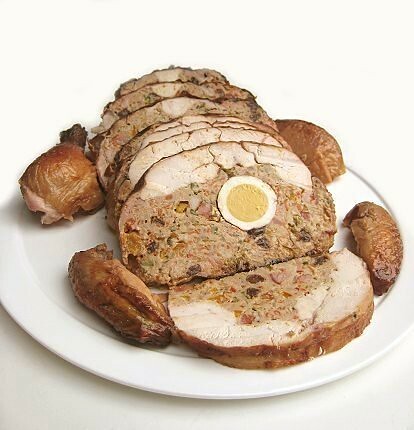 There's the embutido stuffing, plus a hard-boiled egg. Getting ready to sew the bird back up. Of course, knowing that we were making rellenong manok, one would think that we would've gotten ourselves ready by acquiring tools needed the the job. For example, a needle so that I could sew the chickens up. But noooooooo. We did no such thing. So, I had to make-do. Here's my ghetto way. 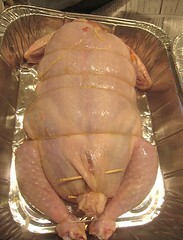 After closing the skin, I tied string around the armpits of the chicken, and another one around the drumsticks. 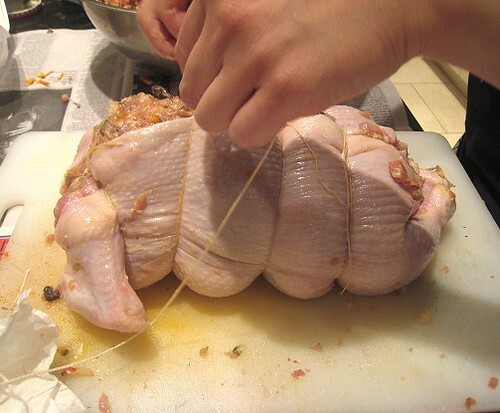 I tied more string around the body of the chicken, much the same way one would do when tying up a roast. As you can see, this left gaps open, much like the gaps between buttons of a too-tight shirt. Don't fear, I have a solution for that! 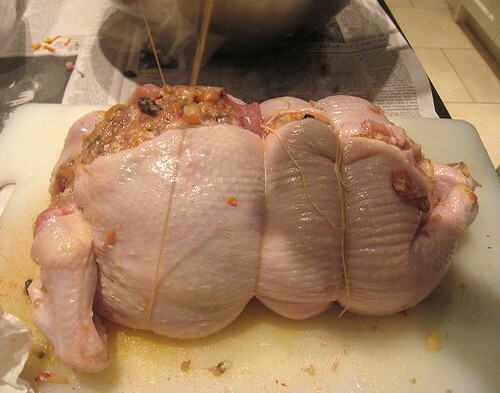 Once the chickens are stuffed and "sewn", TS rubbed the outside with some soy sauce to produce that honey-lacquered look, while I gave instructions to rub evenly, as in "You missed a spot there." If one wishes, one could rub a mixture of soy sauce and kalamansi on the skin, like when making Lechon Manok (Philippine Roast Chicken). Actually, it was probably easier to do three chickens rather than just one, what with the learning curve and all that. As for my solution to those gaps between strings? If you can see above, I toothpicked any wide openings. Then, I strung some string around them like shoelaces. Don't worry, you'll see my genius more clearly in a later photo. 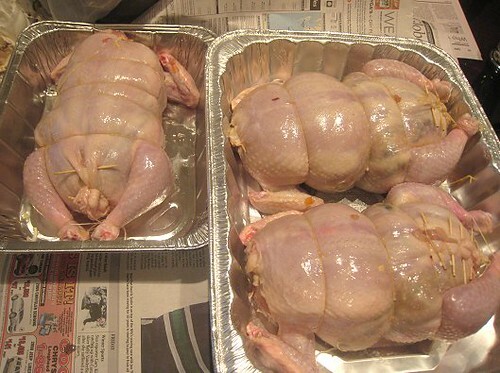 Then, it is a matter of roasting the chickens until they're done. It took about an hour and a half, even a little more, for the chickens to get done. 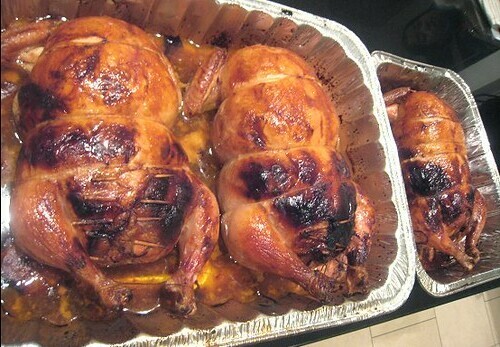 The three chickens finished cooking when evening was upon us, hence, I didn't get a chance to take pictures! So, sorry to the guests, but I hid one chicken so that I could take photographs in natural light the next day. 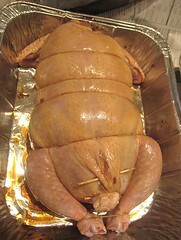 That's why the skin on the bird above is wrinkly; it had sit overnight, plus it was cold. Here's what they looked like fresh out of the oven. Ah, Rellenong Manok is just so wonderful. It's a show-stopper! The combination of the chicken juices with the pork juices is just heavenly. Of course, we have already declared our love for the embutido, with its flavour interplays of savoury and sweet. 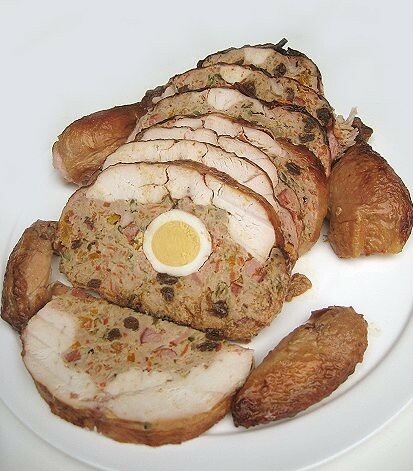 There is also a textural interplay between the soft embutido filling and the fleshier, meatier breast of chicken. 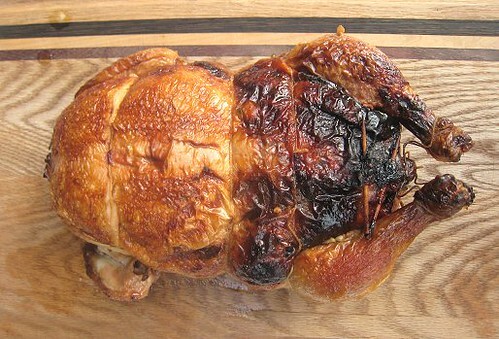 Include in each mouthful a bit of that crispy skin and it really is going to be a festive time in your mouth. 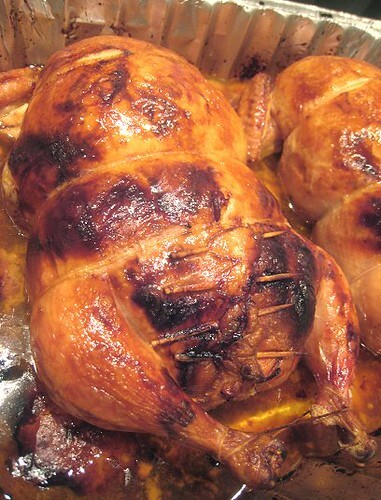 The cold rellenong manok looks a bit dry, but here is how it looked while still hot. Of course, we poured over any juices released during cooking right back onto the chickens. Taken during the party, without natural light. But look at the juices! For a larger quantity of stuffing, feel free to double the recipe. 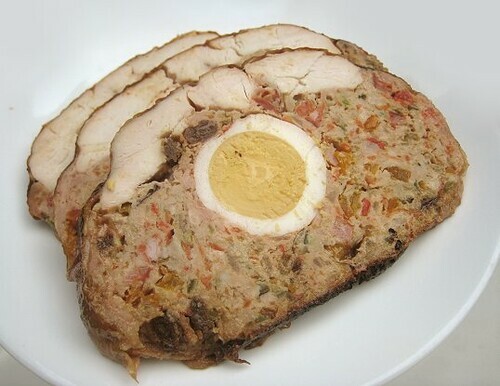 For a really large quantity, see our Embutido (Philippine Pork Roll) post. 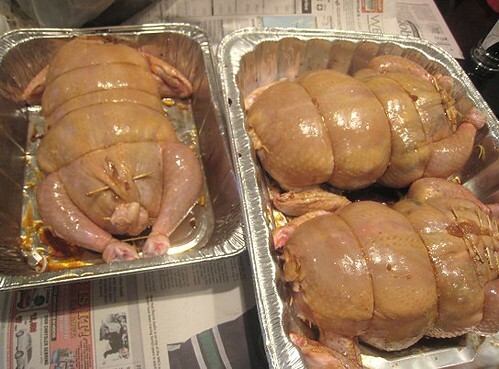 Debone chicken, leaving the breast meat intact, as well as the wings and legs. See here for tutorial (stop at step #6). The filling is very forgiving. 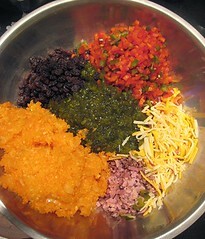 Feel free to adjust quantities of ingredients to suit your tastes. 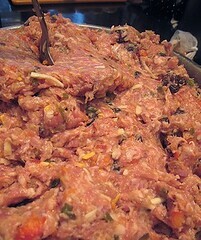 To prepare the pork filling, combine all ingredients and mix well. Stuff filling into the chicken, making sure to include the hard-boiled eggs and vienna sausages (if using). Sew the opening. Rub soy sauce on the chicken. Roast chicken in 350F oven until done, about 1 hour or so. When chicken has finished cooking, slice and serve. I wish someone would make this for me. It looks delicious. Love the yin-yang that goes on between you two. 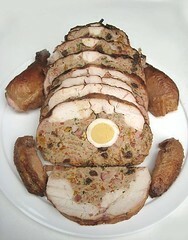 So THIS is why my grandmother taught me how to sew when I was little...so I could sew a chicken full of meat up! Wow that is quite a dish! Thanks! It's certainly a dish that I also want others to make for me. I didn't think of it like that... I guess that's why it's best to leave the wings and legs intact. The _Boxing Helena_ look is no good. Haha, not quite. 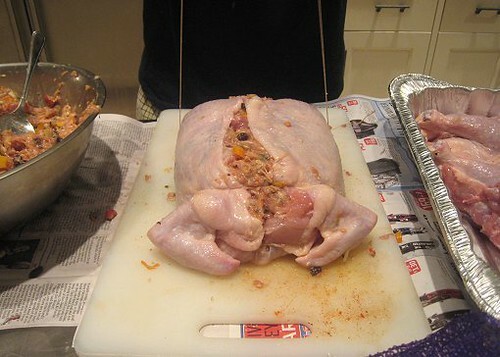 It's good that I only do surgery on poultry and not on people. Childhood memories of eating this dish is actually quite, quite fuzzy, so I;m not sure what condiment I used to use. This time around, I ate it plain with rice.